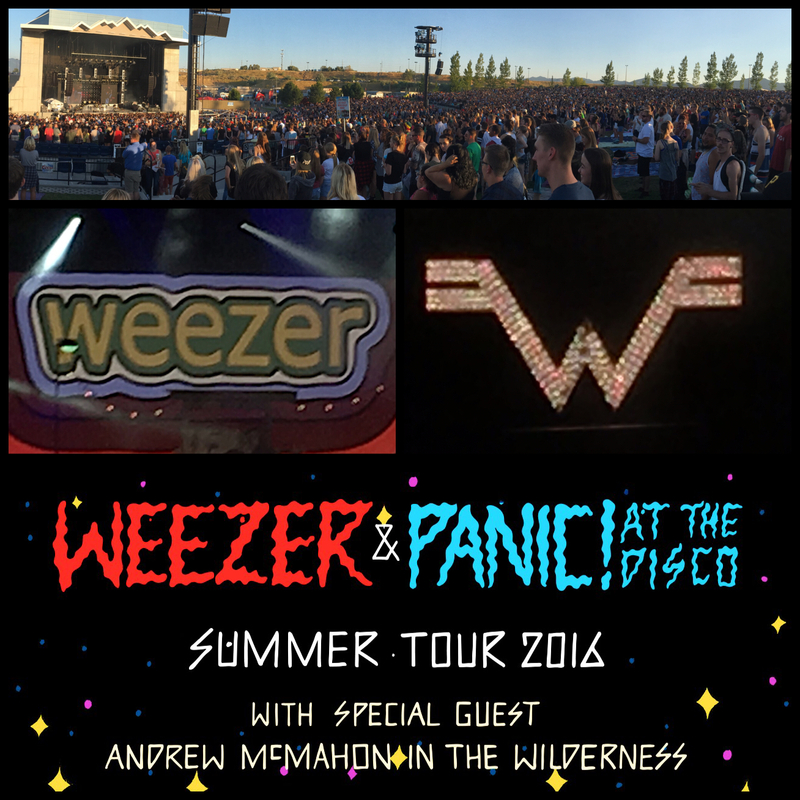 One of the most anticipated concerts of the summer has to be the Weezer and Panic! At The Disco tour. You read me right. Weezer and Panic! At The Disco are on tour together. These bands really could not be more different. I remember when I saw this, I was really confused as to why these bands would be paired together. Whatever the reason, they brought their traveling show to the USANA Amphitheater last night. The show opened with Andrew McMahon and The Wilderness of Jack’s Mannequin and Something Corporate fame. I thought he did a solid job getting things started. I always feel bad for opening bands at USANA. They usually go on about an hour before sunset, therefore the sun is just blazing right in their face. They must be burning up! McMahon didn’t seem to feel the heat as he went from playing piano, to moving all around the stage, and at one point making his way all the way out to the lawn where the band had placed a parachute to be used elementary school style. Fans held the edges as other fans ran underneath. He closed with his most recent hit, “Cecillia and the Satellite”. Panic! At The Disco followed about twenty minutes later. Now one thing I’ll say for sure, Panic won the t-shirt battle. Everywhere I looked the amphitheater was flooded with Panic! At The Disco shirts. For a minute there I was worried for Weezer that they’d be playing to a half empty venue. From minute one of Panic’s set, they were singing every word and in a state of euphoria. They were filming their favorite songs, and singing in each other’s faces as you would expect of people seeing their favorite band. I looked around the venue, and these girls certainly weren’t the only ones loving this performance. And don’t get me wrong, I was really impressed with the band. Their sound is really unique, and Brendon Urie has an incredible vocal range. He played piano, and drums and guitar throughout the set. Their sound seemed to blend together a number of genres from jazz, to punk, to B-52’s, to Modern Rock. They even covered Queen’s “Bohemian Rhapsody”. Urie certainly had the vocal range, and kudos to the rest of the band for pulling off the song. It certainly was a crowd pleaser. I mean, who doesn’t love “Bohemian Rhapsody”? I was happy for all of those who were there primarily to see Panic. They were given a great show, and I’d say even most Weezer fans would come away from seeing Panic! At The Disco appreciating their performance and talent. Now, when Weezer took the stage, USANA Amphitheater still seemed to be at capacity. So my worries that Weezer wouldn’t be playing to a full crowd were unnecessary. The band opened with “California Kids” from their newest album. It’s always interesting to see how new songs go over with a crowd wanting to hear hits, as well as other fans who came to see the other headliner. But it was the perfect opening song to get things going. Surprising to me, the crowd sang along. So I was foolish for assuming people might not want to hear it. From there the band rolled out about some of their biggest hits and best songs. I was out on the lawn, and the enormous sold out venue was in a frenzy at this point. There were people head banging to “Hash Pipe”, as well as possibly busting out their own hash pipe in celebration. There were others dancing like no one was looking during “Pork and Beans”, or “Perfect Situation”. “Perfect Situation” being a personal favorite of mine. I found it interesting that during this stage of the concert, the middle school Panic! At The Disco fans were now watching me, happy for me that I was getting to experience the euphoria they had previously felt. It would seem my excitement got them a little more excited and they began to dance, and even sang along to songs that they were surprised that they knew. I’m just going to say, I was not holding back. Weezer songs are so fun to sing along to. And was I singing along! I was pumping my fist, screaming lyrics, and there may have been a few clumsy dance moves. I looked over to some fans around me in the middle of the song “Beverly Hills”. At the same time they looked over at me. We caught each other in a state of perma grin. We laughed and i said, “How awesome is this?!”. They followed with, “This is incredible!!!! Wooooo!”. And they we sang the lyrics as loudly as we could. There is not much I enjoy more than bonding with a complete stranger over a similar interest. When I sit back and think about why this Weezer set was so great, I strangely had to stop and thing about it for a minute to get a solid answer. Their lighting and the graphics on the big screen behind the band are really cool, but that’s not what makes the show great. 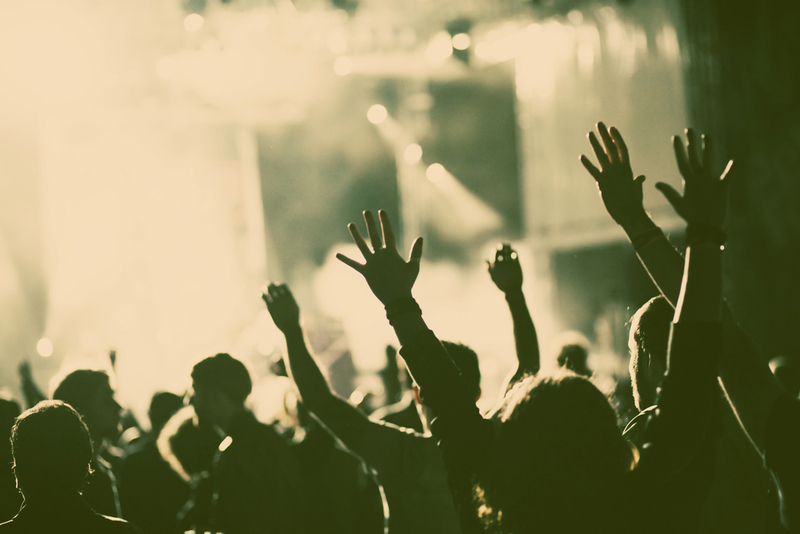 They don’t do a ton of crowd work, so that’s not why I was so happy with concert. They don’t dance, or run all around the stage, or have a really powerful presence on the stage. Don’t get me wrong, they’re fun. Rivers Cuomo sang one song with a crown and royal cape, another with a sombrero or oversized cowboy hat (Hard to tell from the lawn.). They brought out a bunch of huge beach balls and threw them into the audience. They even read some tweets that had been posted about the show. So their stage presence is not boring by any means. But that can’t be why the show was so great. And after sifting through the reasons I came to a conclusion. This show was amazing because they sound great live, and they have outstanding songs that are perfect for a concert. Their songs are so memorable that even if you aren’t a huge fan, you still know all the words. All in all, it was a very good night for live music. All three bands did a great job. And for me, Weezer was in the right place. Closing the show. I have no doubt that there were probably some fans in attendance that would have preferred Panic! At The Disco close the show. I’m sure it’s all a matter of perspective. But if you were a fan of one over the other, or a fan of both, I know everyone there could agree that even though these bands seemed to be an unusual pairing, they brought us a really fun night.